1975 – Archie Griffin, running back for Ohio State University becomes the first player in history to win the Heisman Trophy two years in a row. In 1974, Griffin became only the fifth player in history to win the Heisman trophy, annual awarded to the most outstanding player in college football. He followed up by winning the award as a senior after amassing an NCAA record-breaking 5,177 career rushing yards and leading the Buckeyes to a record of 29-1-1. 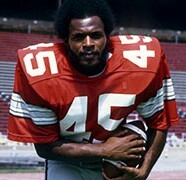 Griffin’s number 45 jersey was the first ever retired by Ohio State. He would later spend seven years playing in the National Football League. 1972 – The Temptations earn their four chart-topping hit when “Papa Was A Rollin’ Stone” reaches #1 on the Billboard Hot 100. The legendary Motown group had previously hit number one with “My Girl” in 1964, “I Can’t Get Next to You” in 1969 and “Just My Imagination” in 1971.